Foss State park is located in western Oklahoma, just north of Route 66, where the slow-moving Washita River winds through prairie and farmlands to merge with Foss Reservoir. 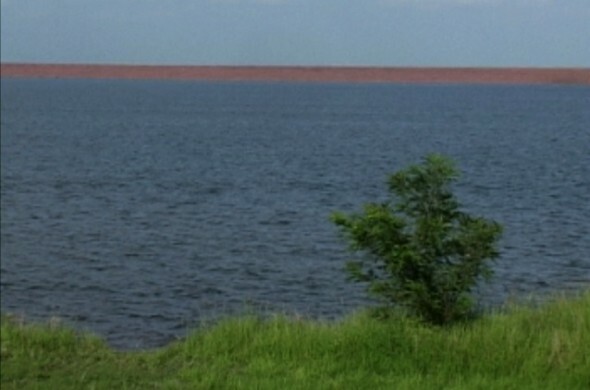 The man-made reservoir, over 8,800 acres, is actually the largest lake in western Oklahoma. With 63 miles of shoreline Foss has a reputation for excellent sand bass, striped bass, catfish, crappie and walleye fishing. It is also a popular local spot for all kinds of watersports. 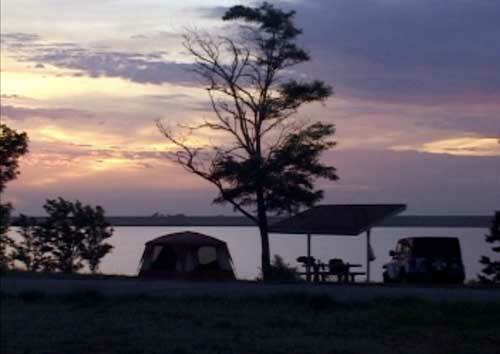 Comfortable campsites are well-spaced for privacy, and there are a number of lovely spots right on the lake. It is an ideal base for exploring this corner of western Oklahoma characterized by gently rolling hills, ravines, and bottomlands laced with creeks that shelter all sorts of wildlife — from the common white-tailed deer to the rare Texas horned lizard (an endangered species in Oklahoma). The abundant wildlife once attracted nomadic Native American hunters, and archeological surveys in the region have uncovered many artifacts chronicling their day to day activities. Bison horns, antlers, stone scrapers, pottery shards and fire rings, all provide evidence of their presence in the area around the Washita River dating back to the 1500’s. As european settlers moved in, they transformed the rolling prairie of bluestem, grama, and buffalo grass into cropland. But after the Dust Bowl days of the 1930’s, many of the old homesteads were turned back into native prairie. The Washita National Wildlife Refuge was established on the north side of the reservoir in 1961 under the Fish & Wildlife Coordination Act primarily to provide a resting and feeding area for migrating and wintering waterfowl (For more about the refuge, see: Washita NWR website). The refuge lies within the transition zone between the tall grass and short grass prairies. These grasses produce seeds that are consumed by rodents such as kangaroo rats, pocket-mice and deer mice. The rodents, in turn, are eaten by bobcats, coyotes, and numerous birds of prey. The various wildlife find the diverse habitats created by open waters, shallow marshes and planted crops quite attractive, and visitors can see impressive numbers of wintering geese, Bald Eagles and Sandhill Cranes, among other speices. In winter don’t miss the chance to see wintering geese feeding in farm fields from the observation deck behind headquarters. And don’t forget the prairie dog town! Visitors who don’t have enough time for hiking, but would still like to see some wildlife, can pick up the road-based “Great Plains Trail of Oklahoma” (see more on the Great Plains trail website). Designed to delight wildlife enthusiasts, the Great Plains Trail consists of 13 highway-based, driving loops that span the entire western portion of the state. Each loop guides travelers through areas with the best opportunities to view wildlife and includes designated stopping points on both public and private lands. It also gives visitors an opportunity to appreciate the region’s rich cultural history, beautiful landscapes, scenic drives and open spaces. The detailed itinerary points out specifics on terrain, types of wildlife in the area, and indicates “stops.” Many of these are historical sites showcasing the state’s rich Native American heritage. The “Black Kettle” Loop, which starts near Foss Lake is named after Chief Black Kettle, a Cheyenne leader who was killed in a massacre by General George Armstrong Custer at Washita in 1868 (learn more about Chief Black Kettle). Travelers with high clearance vehicles, can take the 14 mile Black Kettle Grassland Scenic Route across mixed-grass prairie, red shale hills and wooded ravines. When visiting the grasslands you will notice cattle grazing and windmills pumping water for them to drink. The cattle actually belong to local ranchers who have permits for grazing their herds on the National Grassland. Facilities: Recreational activities include hiking, biking, horseback riding, fishing, boating, swimming and camping. The park has 19 miles of multi use trails. 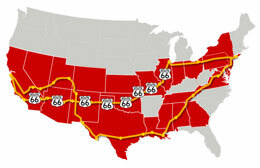 There are 110 RV campsites and 35 tent sites. The park has a great equestrian trail and horse camp, but you must bring your own horse (there are no rental stables). Don’t miss viewing the resident bison herd at the Park office. Directions: Foss Lake is located eleven miles West of Clinton, Oklahoma, then two miles North on Highway 44, or about seven miles North of Foss, Oklahoma on Highway 44. This entry was posted on Thursday, July 15th, 2010 at 6:13 pm. It is filed under The Great Outdoors and tagged with attractions, camping, cows, foss, hiking, native americans, oklahoma, road trip, route 66, tourism, wildlife. You can follow any responses to this entry through the RSS 2.0 feed.